Can you clean the fabric easily or some fabric you can remove and some can’t with this car seat? also, are the belts removable as well in case my kid throws up in it? Your daughter is precious! Thank you for the review! Do you the seat would be comfortable during long road trips? Thank you for doing the review! I’ve been waiting for someone’s personal opinion on it before we ordered it. Where did you find it? Everywhere I look says you can’t order it yet. Thank you! How did you happen to get this product for testing? I always wanted to know and would love to test things for an honest review. 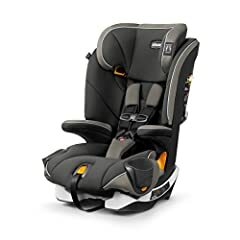 I am looking at this seat for my 3 year old and between this and Britax. I read the carseats for the littles review and saw that the unremoveable chest clip pads really bother some kids. That’s really the only thing preventing me from buying it at this point, since I have a son with SPD and little things like that bother him. Does your daughter mind them at all? I really want to go try one out and fit my son in it first, but I can’t find one locally. Hi! 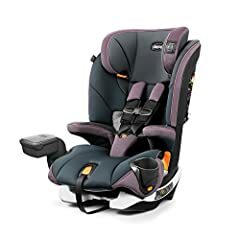 I’m looking into this carseat 🙂 I would like to know if your daughter falls asleep, does her head fall forward in this carseat or can she rest her head to the side without it falling forward? Hi wanted to know if you are using the seat belt or the latch for harness mode ? Got the Chicco Myfit coming today. I got mine 160.00 shipping included. I had the Nextfit and loved that big heavy bulky thing, and the Britax boulevard. Loved it also! About to put those up for sale since im getting 2 of these. Waiting on the blue one to come back in stock.